Being stuck out in the wilderness is no laughing matter; you need to outwit the elements, wild animals and even your own complacency in a bid to survive. Though tools can help you to some extent, mastering a few survival skills could mean the difference between life and death. Your campsite should ideally be high and dry. Always avoid paths and valleys where water is known to flow. 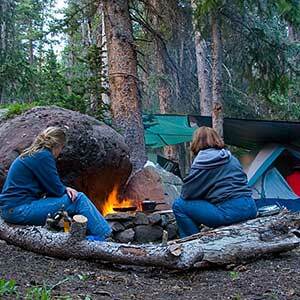 Make sure to check a potential campsite for natural dangers like caves and insect nests. Avoid camping under a dry tree, or near a hill, in order to avoid falling branches or rocks, but try to stay close to sources of dry wood and water. Select a fire site where there is no ground debris or overhanging branches that might catch fire and spread out of control. Building a fire requires three main elements, i.e. tinder (dry moss, bark, leaves or even the lint from your pockets), some small twigs and then larger chunks of wood.You can get a spark to ignite the tinder using a battery of any type; all you need to do is short-circuit it. Hold it close to the tinder and connect the negative terminal to the positive terminal using a piece of foil such a gum wrapper, or strands of steel wool if you have any. This will create a spark which will fall onto the tinder. It will help if you can smear Vaseline or even lip balm on the tinder first. Breathe (don’t blow) gently on the sparks until the tinder catches, then add the twigs one at a time before starting with increasingly large pieces of wood. You’ll find two types of water in the wilderness; one is purified and the other will make you ill. As a rule, standing water is bad, so avoid puddles and ponds. If it’s your only source, boil the water for at least ten minutes, which kills all the pathogens. Rain, dew, and snow are some of the best sources of clean water that can be collected with ease. A few bandanas can be used to collect a gallon of water by soaking up the dew. Maple trees are also a source of fresh water; just cut open the bark and allow the water to flow, a natural energy drink! Plants sweat too, just as we do throughout the day. The process is called transpiration and the water is clean, so to take advantage of this all you need is a clear plastic bag wrapped around a leafy branch. Water will then start to condense on the bag. You do not have to go hunting to eat. 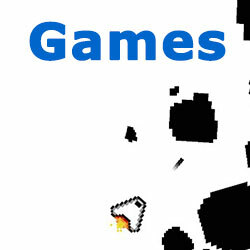 Hunting for larger animals, such as deer, is a waste of energy if you’re not experienced. A lot of small plants are nutritious, but only if you can identify them safely. There are many different books and phone apps you can use. ‘Gigging’, for those who do not know, is hunting for small critters with a multi-pronged spear. This is the simplest method to catch everything from fish and frogs to snakes. Cut a sapling about an inch in diameter and split the fat end into four equal sections using a pocket chainsaw or a Swiss army knife. Push a stick into the split so as to spread the sections apart, and sharpen the points. 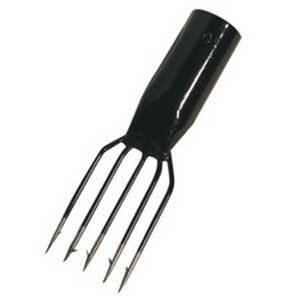 Now you have a very easy to use four-pronged spear. If you find yourself without a GPS receiver, you can still identify the north-south line using the sun and an analog watch. In the northern hemisphere, all you have to do is hold up the watch horizontally and point its hour hand at the sun. Draw an imaginary line to the center of the watch and then up to the twelve. Cut the angle in half mentally with a second line (for example, if the hour hand is on the 4, then your second line should run through the 2) and this is the north-south line. North is the direction away from the sun, south is the direction towards the sun. The key is locating the Polaris, or the North Star. Learn how to identify the Big Dipper, which is always visible in the night sky and looks as exactly as its name suggests. It’s a little harder in the fall, as it’s near the horizon. Find the side of the Dipper away from the handle and extend a line outwards from those two stars. This will line up directly with Polaris, or the North Star, which means you’re facing north. Don’t try to use any other stars, as they all appear to move round Polaris, which remains stationary. Knowing how to tie an array of knots is very important. However, the most important is the bowline. The bowline is a foolproof knot when it comes to securing anything or climbing up a steep mountain face. 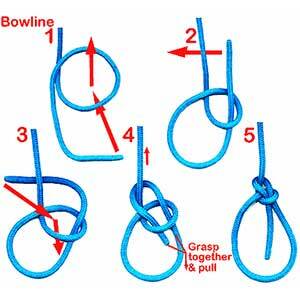 There are numerous websites that show the right way of tying the bowline, and it is not all that difficult to master.